In 2005 Rodney Eade was an inaugural Legend inductee into Tasmanian Football’s Hall of Fame. Catching the eye of mainland talent scouts while playing with Glenorchy, Eade was voted the Tasmanian Football League’s best first year player. The following year he was recruited by the Hawthorn Football Club where he remained until 1987, finishing with 229 games and 46 goals. Eade featured in Hawthorn’s 1978 premiership win over North Melbourne and was instrumental in the club’s 1983 win over Essendon. He was made a life member of the club in 1983. In 1996 Eade took over from Ron Barassi as head coach of the Sydney Football Club. In his first year with the club he took the side to the 1996 Grand Final where they were beaten by North Melbourne. The club made the finals between 1996 and 1999 and again in 2001. 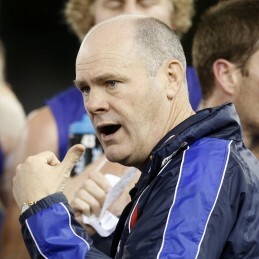 Eade spent the 2003 season as a media writer and commentator before being appointed coach of the Western Bulldogs in 2005. The Bulldogs had won only five games in the previous two years but in his first year Eade took the club to within a single goal of making the finals. The club would play in successive finals campaigns until 2010. 2011 saw Eade appointed as Football and Coaching Strategist with the Collingwood Football Club. A highly respected motivator, Eade’s presentations address the audience’s personal and professional challenges, drawing on his leadership, teambuilding and motivational skills. His anecdotes and other experiences leave audiences positively charged.